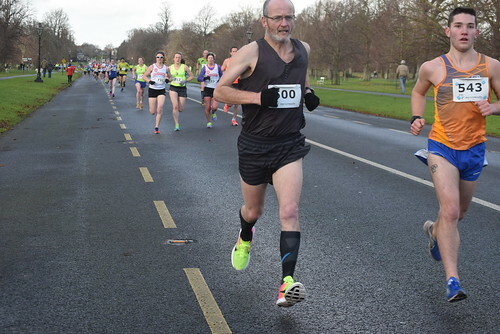 This is a photograph from the 13th annual running of the Tom Brennan Memorial 5KM Road Race and Fun Run which was held on Furze Road, Phoenix Park, Chapelizod, Dublin, Ireland on New Year's Day Monday 1st January 2018 at 12:00. The race route is a two loop course which starts and finishes on the Furze Road in the middle of the Phoenix Park. Participants follow a clockwise, right-handed, looped route around Furze Road, Ordnance Survey and Chesterfield Avenue. The loop course is also another difference of this race from traditional 5KM road racing. The weather on New Year's Day in the Phoenix Park is always unpredictable and today was no different. A particularly strong headwind into the faces of participants along Furze road (between 2KM and 3KM) made this particular section tough going for everyone. There was also a particularly cold icy feel in the air. However several hundred runners, joggers and walkers shook off the effects of Christmas celebrations to take part. The route itself is flat without any noticeable undulations. This year's race had one of the biggest field of participants in its long and well established history. The race is organised and promoted by the local athletics club Liffey Valley Athletic Club who are based in Islandbridge, Dublin 8 and have a catchment area around this part of Dublin city. The race itself commemorates the memory and contribution of former club member Tom Brennan who won the National Cross Country Championships in 1975 in UCD Belfield at the age of 24 years. A special commemorative perpetual trophy is presented to the winner of the race every year. The race is also of particular interest to those runners, joggers and walkers who are not necessarily involved in the competitive side of road racing. Annually the race is the first of a series of races in Dublin city which make up the Lord Mayor’s 5 Alive Challenge. This initiative by Dublin City Council is now in its sixth year and several hundred runners, joggers and walkers volunteer to take part in five of Dublin’s most popular road races. Dublin City Council makes an open call for people to register to be a part of the programme in autumn every year. The Liffey Valley Club and many other volunteers work hard to make this a very successful event. Undertaking a road race event in any location is a challenging task. However the Phoenix Park presents a unique challenge in terms of traffic flow around this part of Dublin and general logistics. Despite this these efforst by the host club are greatly appreciated as is evident by the turn out every year. It provides a splendid opening of the New Year for runners of all abilities. It is also a fitting 'official' start to the new calendar year of road racing in the Dublin and North Leinster region. Yes - of course you can! Flickr provides several ways to share this and other photographs in this Flickr set. You can share directly to: email, Facebook, Instagram, Pinterest, Twitter, Tumblr, LiveJournal, and Wordpress and Blogger blog sites. Your mobile, tablet, or desktop device will also offer you several different options for sharing this photo page on your social media outlets. We take these photographs as a hobby and as a contribution to the running community in Ireland. We do not charge for our photographs. Our only "cost" is that we request that if you are using these images: (1) on social media sites such as Facebook, Tumblr, Pinterest, Twitter,LinkedIn, Google+, VK.com, Vine, Meetup, Tagged, Ask.fm,etc or (2) other websites, blogs, web multimedia, commercial/promotional material that you must provide a link back to our Flickr page to attribute us or acknowledge us as the original photographers. This also extends to the use of these images for Facebook profile pictures. In these cases please make a separate wall or blog post with a link to our Flickr page. If you do not know how this should be done for Facebook or other social media please email us and we will be happy to help suggest how to link to us. You can download this photographic image here directly to your computer or device. This version is the low resolution web-quality image. How to download will vary slight from device to device and from browser to browser. Have a look for a down-arrow symbol or the link to 'View/Download' all sizes. When you click on either of these you will be presented with the option to download the image. Remember just doing a right-click and "save target as" will not work on Flickr. In summary please remember when requesting photographs from us - If you are using the photographs online all we ask is for you to provide a link back to our Flickr set or Flickr pages. You will find the link above clearly outlined in the description text which accompanies this photograph. Taking these photographs and preparing them for online posting takes a significant effort and time. We are not posting photographs to Flickr for commercial reasons. If you really like what we do please spread the link around your social media, send us an email, leave a comment beside the photographs, send us a Flickr email, etc. If you are using the photographs in newspapers or magazines we ask that you mention where the original photograph came from.